Come…fall in love! For twenty years, and many more to come! Since Dilwale Dulhania Le Jayenge was released in October 15 1995, the most famous Bollywood film of all time has influenced generations of people with the love story of Raj and Simran, flawlessly portrayed by Shah Rukh Khan and Kajol. The film not only turned them into stars, but also laid the foundations of future romantic comedies. 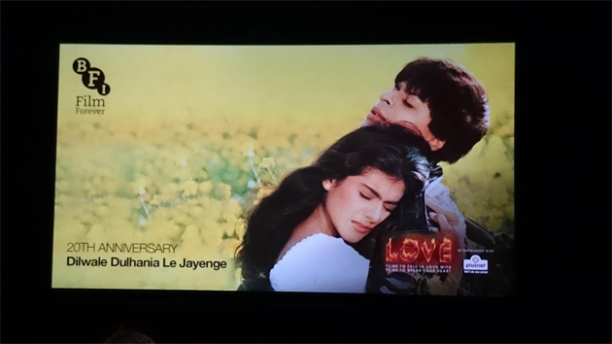 On the occasion of the 20th anniversary of the release of DDLJ, the BFI hosted a very special screening of the Bollywood blockbuster, as part of their Love season, which includes classics such as Casablanca and Titanic. Raj and Pablo from BBC Asian Network were the hosts of such special event, which started with a performance by dancers of the Absolute Bollywood ensemble, who danced to some of the most iconic Bollywood tunes, including some the film songs. The event also included the resolution of the DDLJ contest organised by B4U channel, which during the last few weeks has been looking for the Raj and Simran of the UK. The winners of the contest were greeted onstage by a representative of YRF, but far from being enough, they also received a very special gift: a video message from SRK himself! A packed screen full of SRK fans and Bollywood nostalgics had the opportunity to relive some of the most emblematic moments of the film. They laughed with Raj’s silly jokes; they cried with Simran’s helplessness; they were moved by the couple’s fearlessness. In short, they fell in love with the film all over again in a unique experience!